Lil' Starts: Our Latest Farmer Loan Recipient! 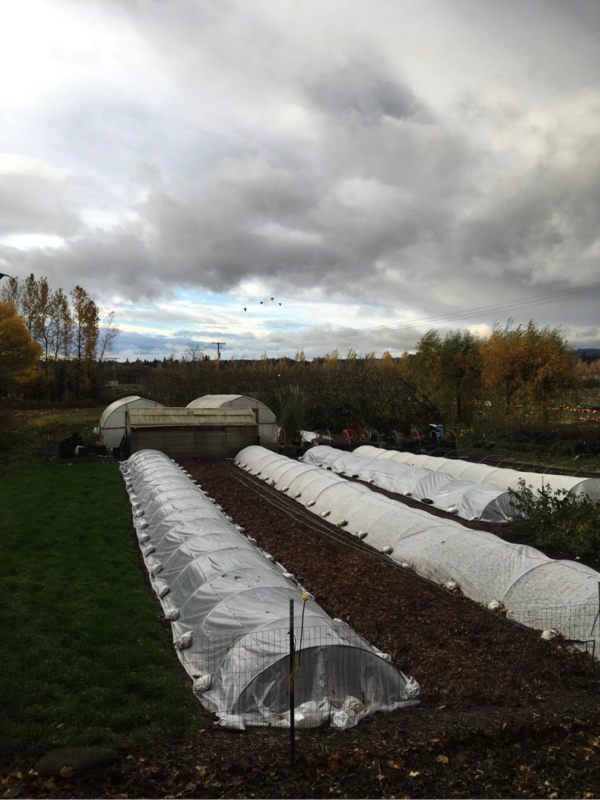 I’m delighted to announce that People’s Food Co-op was able to give Lil’ Starts, a local urban farm in NE Portland, a $1000 loan through our interest-free farmer loan program! This is something we offer to those who may need a little help getting started launching their new farm or new project. We reached out to Lil’ Starts and asked the two owners (Lilly and Luke) about their gorgeous lil’2-acre farm so we all can get to know them better. Here is the conversation I had with Lilly about their practices on the farm and where they are offering their starts and produce this season. I read on your site that you are passionate about natural and sustainable growing methods, as well as how Lil' Starts uses permaculture and biodynamic principles. Can you tell me a little more about that? What sort of methods do you use for natural and sustainable growing? What sorts of principles go into permaculture and biodynamic growing for Lil' Starts? At Lil’ Starts we wholeheartedly believe in growing clean, healthy, sustainable produce and plants for our community. Our farm is 100% free of GMO’s, pesticides and synthetic fertilizers. We feed with compost teas made with compost and worm castings from the farm and fish fertilizer we ferment from salmon scraps given to us from local fishermen friends. We buy amendments from local farm stores to supplement our field soil and to use in our potting mix- fish bonemeal, alfalfa meal, sea kelp; the only mined amendments we use are azomite and dolomite lime. Our compost is a good mix of chicken straw and droppings, plant material and leaves, and kombucha and fruit scraps from our friends at Lion Heart Kombucha – they are located just around the corner from us and the SCOBY culture, ginger and fruit pulps, and green and black tea leftovers definitely keeps our compost piles heated up, decomposing and loaded with probiotics. We’ve always loved the smell of good compost but this stuff makes it absolutely divine, when we turn the pile or add more Lion Heart material the whole farm smells good. For pest control, prevention is key and that is why we encourage healthy soil by limiting the amount we till (we only use a small BCS tiller when we are breaking ground or have let a bed go fallow otherwise it’s wheel and hand hoes and broad forks), limiting our use of amendments and allowing flowers and seed heads to grow all over to encourage beneficial insects. We also spray our crops weekly with compost tea in the early part of their lives. We also spray with a farm made mix of hot pepper, garlic, rosemary, lavender and sesame oil tea at the first sign of pest infestation. We do keep a bottle of organic plant-based neem oil around in case of emergencies but luckily we hardly ever need to use it. Slugs can be a big problem and we have had to resort to using organic Sluggo in super wet springs. We have a small flock of chickens and regularly add food grade diatomaceous earth to both their feed and sprinkled in their coop to kill off mites, lice, and internal parasites. Apple cider vinegar gets added to their water once a week for the same reason. Our flock has a rotating pasture and we also feed them high-quality Union Point feed from Brownsville Oregon. Do you offer a CSA program? If so, what CSA programs do you currently have available for people to sign up for the 2018 season? We offer two CSA programs. Our Veggie CSA is sold out for 2018 (thank you community!). We have a few spots left for our Gardeners CSA. This is a live plant CSA designed for backyard gardeners that supplies you with ready to plant veggie, flower and herb stars once a month during the growing season. The Main Season option runs April thru July for $150. The Late Season option will make sure you have a late fall, winter, and early spring harvest and runs August thru October for $65. Spring has sprung! Which means that farmers' market season is here! Where can we find Lil' Starts this season? This market season you can find us selling plants at Montavilla and St. John’s Farmers Market in May and June. We will be offering our produce all season long at Woodlawn Farmers Market, Hawthorne Farmers Market, and Kenton Farmers Market.